Market research was developed a century ago to measure the effectiveness of advertisements and products. Today it’s used in similar ways—to figure out competitive positioning, determine the optimal price for new products, or to decide on the most effective advertising strategies (to name a few). 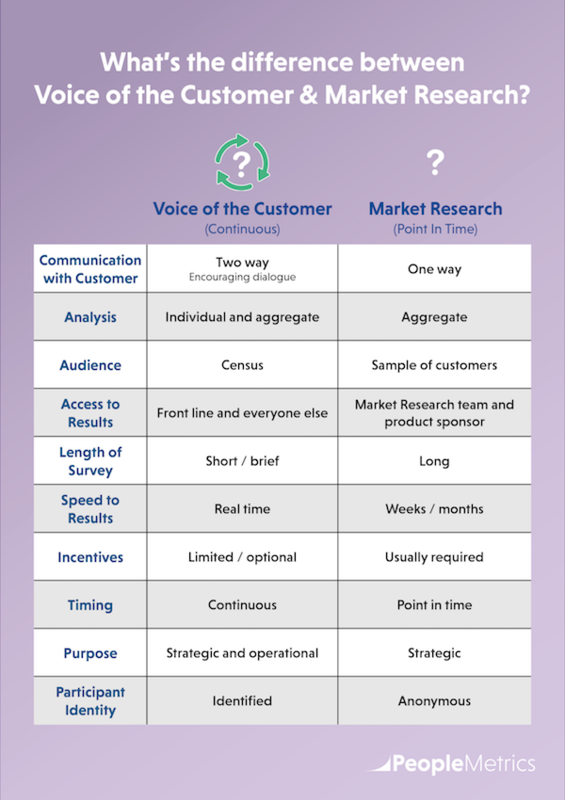 However, market research and Voice of the Customer (VoC) are not the same. In fact, certain key principles of market research actually hold back VoC and the value that some companies get out of their VoC programs. Let me explain. Market research is generally focused on getting an answer to a specific strategic question, so studies have a distinct beginning and end. Market researchers usually reach out to a small sample of customers for feedback, then focus on aggregate results and trends. Communication is one-way—customers are asked what they think about a certain issue, but there is no further communication beyond that. Results of market research studies often are only seen by the market research team and study sponsor – not the rest of the organization. VoC, on the other hand, focuses on continuously gathering feedback about recent experiences from all customers (not just a small sample). Unlike market research, communication is two-way, enabling companies to follow up with individual customers about their feedback in real-time, ask additional questions, and try to resolve the issue. If you’re using a software platform in conjunction with your VoC program, feedback comes in continuously in real-time, and is immediately shared with everyone in your organization, including the people on the front lines who are facing customers every day. Somewhat surprisingly, VoC and market research are coming together. The reason? VoC programs, with their continuous flow of real-time feedback from every customer (not just a sample of customers), are becoming the single source of truth for customer feedback, for both customer experience and, in some cases, market research teams. Market research budgets are being tightened, but the strategic angle of market research questions never really goes away. 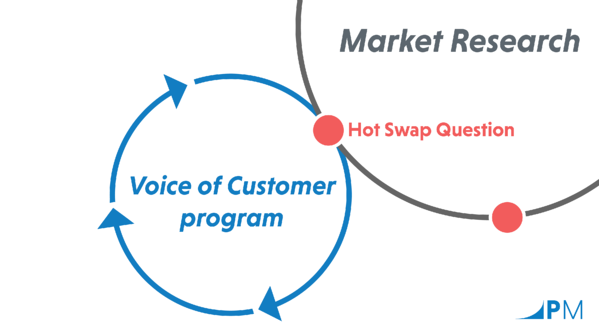 To solve this, market researchers are taking advantage of VoC’s continuous flow of real-time feedback from every customer and inserting market research questions into VoC surveys for a limited period of time to get quick answers before “swapping out” for new questions. Combining market research questions with VoC efficiency gives you an instant advantage. VoC is able to provide incredible value by delivering fast answers more affordably than if a separate market research study were commissioned. Rather than spending $100,000 for one point-in-time market research study, consider getting continuous feedback throughout the year.